William Alexander Usticke was born July 30, 2002 at 2:03am. He was a hefty 6 pounds 3 ounces and 19 inches long. 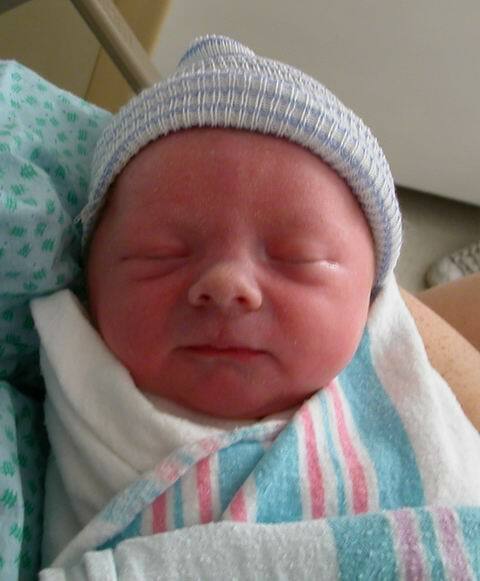 Liam arrived about a month early, but was perfectly healthy. Due to our first child's premature birth, this second pregnancy is considered high risk. Jill has regular appointments with her OB/GYN and a perinatalist; and, now that she is entering the third trimester, her checkups are weekly. At 22 weeks, contractions were detected, and she was sent to the hospital. After hydration, they stopped, and she was released. She has been diagnosed with an irritable uterus. May 27 2002 News: Jill was again sent to the hospital on Thursday. In addition to hydration, she was given terbutaline (also called Brethine) to stop the contractions. We're certainly familiar with this drug, as Jill's doctors gave her many doses over a few days while trying to delay Saffy's premature birth. After four hours, the contractions stopped, and Jill was sent home. May 31 2002 News: Jill is still contracting sporadically and was sent to the hospital again yesterday. Her perinatalist prescribed an ongoing dose of terbutaline. 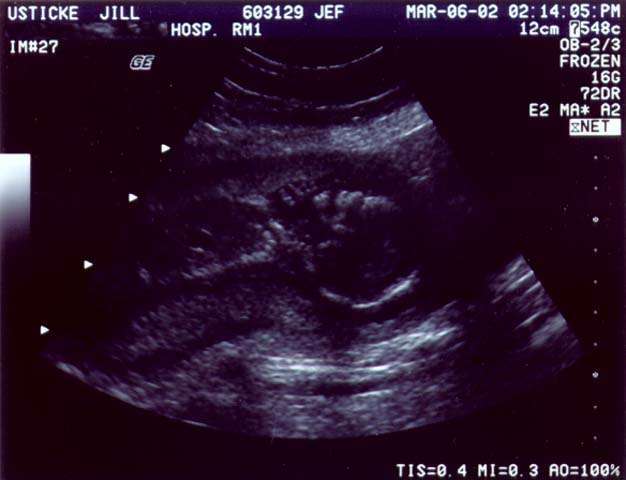 Jun 17 2002 News: Jill is now 30 weeks pregnant, which is when Saffy was prematurely born. The terbutaline seems to have helped somewhat, and we're hoping she will carry the baby full-term (36-40 weeks). Jill's activities have been curtailed, but she has not yet been put on full bed rest (or hospitalized!) --thank goodness. Jul 17 2002 News: Jill's pregnancy has been going very well. She is now five weeks past when Saffy was born, and a week away from what is considered "full term." All the attention from her OB/GYN and perinatalist seems to be beneficial, since she hasn't been hospitalized since May. With our luck, she'll probably go way past her due date. The Guess the Weight pool is now set (below). Three weeks ago, the baby's weight was estimated at 4 lbs., 4 oz. Fetuses typically gain most of their weight in the third trimester, so those who guessed higher may get to name the little one! Jul 24 2002 News: The new baby is now estimated at 5 lbs., 10 oz. The current plan is for Jill to stop the terbutaline next week (week 37). Her doctors are discussing inducing two weeks early to hopefully avoid the placental abruption that occurred with Saffy. We have a pool to guess the new baby's weight. The winner gets to name the new baby (just joking). Actually, no prizes--it's just for fun. The guess must be at least one ounce different from other entries--first come, first serve. Just for comparison, Saffy was 2 lbs., 15 oz. in 2001, Alec was 7 lbs., 11 oz. in 1970, and Jill was 7 lbs., 7 oz. in 1969. Carrie H. Jul 8 2002 5 lbs., 0 oz. Jeff C. Apr 13 2002 5 lbs., 4 oz. Bethann D. May 30 2002 5 lbs., 10 oz. Paul G. Mar 23 2002 5 lbs., 11 oz. Kristie C. Apr 13 2002 5 lbs., 12 oz. Caitlyn U. Mar 30 2002 6 lbs., 0 oz. Kevin & Melissa M. Apr 10 2002 6 lbs., 4 oz. Janet B. Mar 29 2002 6 lbs., 6 oz. Lee Apr 28 2002 6 lbs., 7 oz. Jane R. Mar 19 2002 6 lbs., 8 oz. Jackie T. Apr 27 2002 6 lbs., 9 oz. Pat J. Apr 12 2002 6 lbs., 10 oz. Matt G. Mar 20 2002 6 lbs., 11 oz. George T. May 8 2002 6 lbs., 13 oz. Cathy G. Mar 23 2002 7 lbs., 0 oz. Pep R. May 6 2002 7 lbs., 1 oz. Pan R. Mar 23 2002 7 lbs., 2 oz. Gordon U. Mar 19 2002 7 lbs., 3 oz. Patricia G. Mar 29 2002 7 lbs., 4 oz. Eileen C. Apr 4 2002 7 lbs., 5 oz. Lucas U. Apr 1 2002 7 lbs., 6 oz. Lisa P. Mar 22 2002 7 lbs., 7 oz. Cindy S. Mar 22 2002 7 lbs., 8 oz. Josetta C. Mar 19 2002 7 lbs., 9 oz. Eileen T. Apr 4 2002 7 lbs., 12 oz. Marcus G. Mar 29 2002 7 lbs., 14 oz. John U. Apr 29 2002 8 lbs., 1 oz.